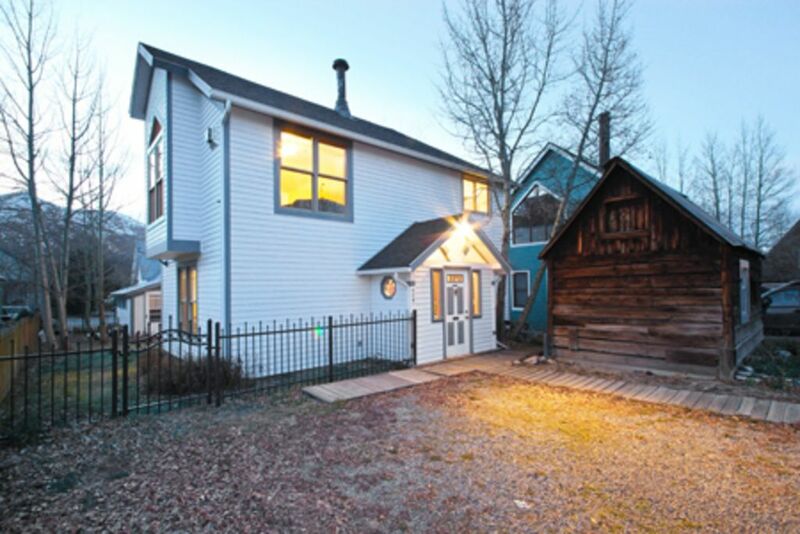 This Beautiful and Comfortable 1700 Square foot house is conviently located in the National Historic District. The quiet residential neighborhood is a four minute walk from the free shuttle, a five minute walk from the grocery, and a six minute walk from the center of downtown. Carter Park with a sledding hill and playground is one block away. Our stunning view of the slopes allows you to watch the sun rise on the Ten Mile Range. Our PRIVATE HOT TUB is right outside the back door in our fenced yard. We do allow approved dogs in the summer season only. My sister and I own this property. Our parents purchased the historic house on the west end of the lot in 1970, the year the Breckenridge ski area started expanding. The rental home was built later to accommodate our growing family. We remain seriously addicted skiers and backcountry travelers, and big fans of Breckenridge. We love the town of Breckenridge for its many varied activities, and we love the ski area because it is so versatile and easy to navigate. We think our home is in a perfect location. We love our home and we hope you will too! It is comfortable and easy to relax in. We have filled it with things that we know make a ski vacation work. It is removed from the bustle of the condo villages, yet close to activities for everyone. The proximity to the shuttle makes it easy for the teens to sleep in and meet us when they are ready. Our fenced backyard provides a safe place for the little ones to dig and tunnel in the snow. Walk three blocks to the center of downtown. All 4 mountain bases accessible by shuttle which runs every 20 minutes in season. Large dining room window shows all four peaks of the Breckenridge area. Enjoy alpenglow with your breakfast, and watch the groomers zigging down the slopes over dinner. Hot water heat is the best, most even heat. Private parking right in front of the door for 2-3 vehicles. Extra towels available for the hot tub. coffee maker and electric tea kettle. We keep basic spices and condiments. You may use these or provide your own. No need to purchase water: our tap water is delicious; it is fresh off the continental divide. Enough pots and pans to fix a feast and enough dishes to feed your family several courses. Fully equipped kitchen includes coffee maker, generous assortment of pots and pans, slow cooker, blender, and loads of dishes. Table seats 8 comfortably and 10 cozily. We have a highchair and a booster seat. Please request them so we can be ready for you. TV in Living Room with Direct TV, and Roku. Second TV in master bedroom has access to streaming. Direct TV. Free online access to streaming. Games and puzzles for all ages. Poker set. legos, duplos, and Lincoln Logs, other building toys and snow toys. Children's library stocked by a teacher. Fenced yard, Sleds, Toys, Games, Humidifier, high chair, and boot dryer. Free WiFi. This was our 3rd time to Breck and we have stayed at Mountain Thunder Lodge, a place in Warrior's Mark and this is our favorite. Best location and value for the money. 5 minute walk to the middle of main street. All of the bedrooms and 2 of the bathrooms are downstairs which made it work for our large family of 6, 8 people can comfortably sleep downstairs and 2 upstairs if needed. Connie was a very helpful with detailed information and made the stay easy. 14" of snow fell the night before and she had driveway completely cleared. Will stay here again! We certainly hope you do return as you seem to have a special talent for bringing the snow! We loved hosting your family and we are glad that our house was such a good fit for you. We thoroughly enjoyed our stay at this lovely house. The location was very convenient for shuttles to the ski area and walking into town. Large kitchen and lounge area. Best of all was the hot tub which we enjoyed after several long ski days! Connie was very responsive to any questions. Would stay again! We are glad you stayed with us and we thank you for bringing snow with you! Please do come again! Great house! Lots of sleeping space. Really close to town and buses for the ski resort. Owners are really nice and very accommodating. There was a hottub, grill, and even condiments and spices already there so we didn’t have to buy more. The entry has a great area to hang coats and place your skis. We loved it, house, hot tub, location, everything. Would love to stay again. Instructions for home very thorough and host very responsive to questions. Location perfecr 5 min walk to Main Street and 2 min walk to free bus. Home was very well equipped for cooking, We cooked roast dinner for Christmas Day. Home is sufficiently spacious with enough bathrooms, decor and furniture very charming. I would love to stay again . I would 100% recommend this beautiful house. My family and I had the best time ever!! ! The house is fully equipped, cozy, clean, sooo conveniently located within walking distance from Main Street, so accessible to all the restaurants, shops and many other activities around the area! Totally Loved this place!!! Perfect spot for a relaxing, beautiful, enjoyable stay. The owners are so friendly, flexible, welcoming, easy to accommodate to any of your needs and just lovely, all around amazing people!!! Thank you so much for sharing your beautiful home with our family and making this trip an unforgettable one. God bless you! Great place close to downtown historical district! Close to dog park!! Definitely come back again! Thank you for coming. Do come back!